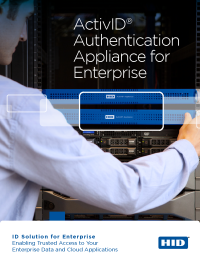 HID Global’s ActivID® Authentication Appliance is used by enterprises and banks worldwide to secure access to networks, cloud applications and online services to prevent breaches and achieve compliance with the updated FFIEC guidance, PCI DSS and equivalent mandates, policies and guidelines. Organizations can reduce costs by deploying a single solution capable of handling a versatile range of multi-factor authentication methods, enabling users to connect securely from any location, at any time via their preferred device. The ActivID solution supports multi-factor authentication with all leading mobile phones and tablets. Built-in support for open protocols ensures that it can be easily integrated into enterprise infrastructure, cloud based services and internet banking engines. Available as a virtual appliance or as hardware, the ActivID Appliance strikes the perfect balance between security, flexibility, cost and convenience. A versatile, easy to deploy multi-factor authentication appliance ideal for securing employee access to enterprise networks and customer access to online banking. A turn-key OSCP responder appliance deployed with the ActivID Validation Authority for distributed PKI Certificate validation.